Saturday was freezing cold but I plucked up the courage and about six scarves to go to the The Museum of Classical Archaeology. And what an interesting place it is. It’s a paradise of plaster casts left over from bygone days when such collections were the thing to have. You certainly feel like you’ve stepped back in time and can almost imagine that you are having your first taste of the classical civilisation. The sculptures sort of inspire you to a cult of man – the perfect human forms make you feel that just being human has somehow elevated you towards to Gods. It’s a peculiar sensation and probably woefully blasphemous! If you can sketch then this is the place to go – in the warm peace of the gallery you could spend hours happily working. The gallery is open on Saturdays during uni term term and Monday to Friday 10am – 5pm the rest of the year. After the warm museum the outside world seemed particularly cold so I hot footed it to the Arts Picture House Cafe where Grahame was ensconced and indulged in a warming beverage. Nice though that was the real excitement came about 7pm when the snow that was promised arrived. Wearing heels and skirts Lucy and I set off to the Punter and arrived without any problems. We sat all evening our noses pressed against the glass watching the layers of powdery snow building up amazed that the weather forecast was so right. We were confident that this would present no problems for our return journey. We stayed. We had another drink. We were the last to leave. Our baskets were full of snow and the wheels half buried. Cycling it transpired was nigh on impossible. We pushed our bikes through the snow along the river for 100 yards then gave up and when onto the road. It was simply impossible to stay up on the bikes. We gave up and tottering on inappropriate shoes made it all the way home but only just. There is something about snow that makes you gleeful and so fuelled with wine generally snowy joy we half dragged ourselves half praded home in what we believed was the spirit of Dionysus on Scott’s expedition. Sunday dawned and the memory of our heroic feats seemed somewhat dimmed so Lucy and I set off for the Fort St George for nourishment and company and a good look at all the snow fun. Snowmen abounded, snow balls whizzed around and there was liberal sprinkling of bonhomie. 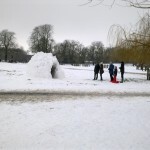 Outside the Fort someone has painstaking constructed an igloo. Everyone was keen to get inside and have a look but being British we were all content to wait in line patiently. 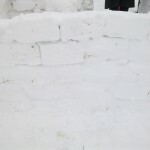 Another group had built a wall out of snow bricks and my favourite was a snow man perched on a bench a pipe in his mouth and his feet swinging nonchalant. 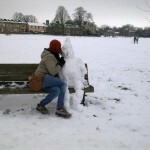 This entry was posted Monday, February 6th, 2012 at 9:49 am	and is filed under Art, Exhibitions, Weather. You can leave a response, or trackback from your own site.